This portrait is a copy of a 1623 painting of James VI & I by Adam de Colone. It is one of a wealth of Stuart images in the university collections which attest to the dynasty's patronage of King's College and later to the prolonged Jacobite sympathies of both King's and Marischal Colleges. James had a turbulent early life. After the abdication of his mother, Mary Queen of Scots in 1567, James ruled as a minor until 1584. He subsequently governed Scotland firmly and effectively until the death of Elizabeth Tudor in 1603, when he ascended to the English throne and proclaimed himself king of Great Britain. 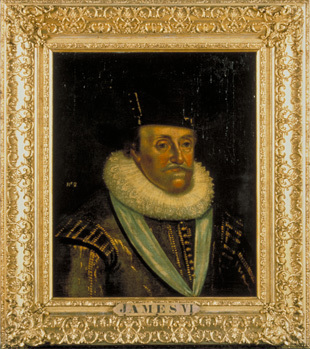 The painting shows an elderly James two years before his death in 1625.